Sober elegance, tailor-made details and flagship accessories. A grandiose stage for the daily show of the Italian kitchen. Precious materials and sought-for finishes, exalted by the discretion of the D90 model that allows utmost freedom of combinations and configuration of doors and fronts, with external handle, built-in handle, mechanical or electrically-assisted opening, retractable doors or front opening pantry. Linear column composition with island and overhanging table. 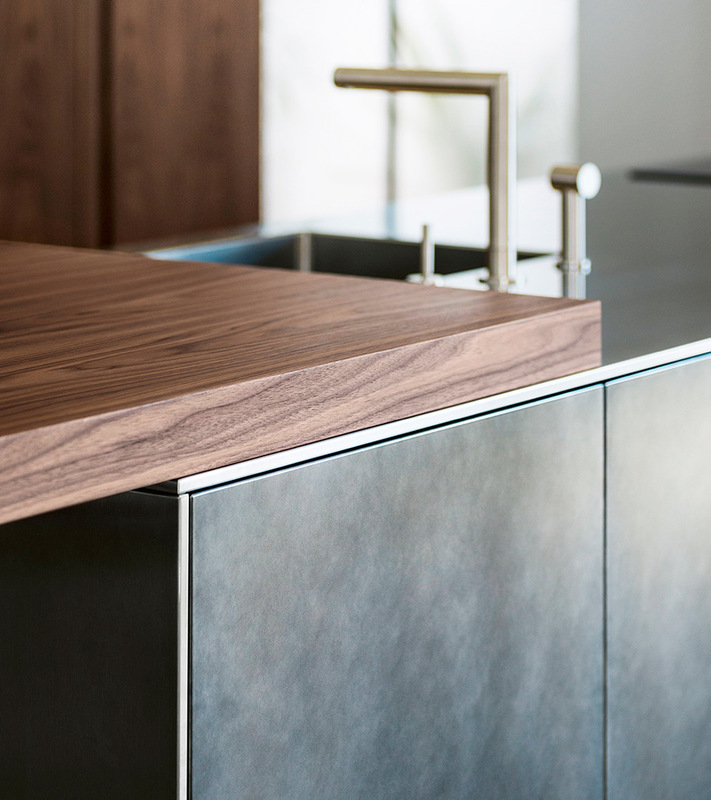 12 mm thick brushed stainless steel frames the island on the sides and worktop. 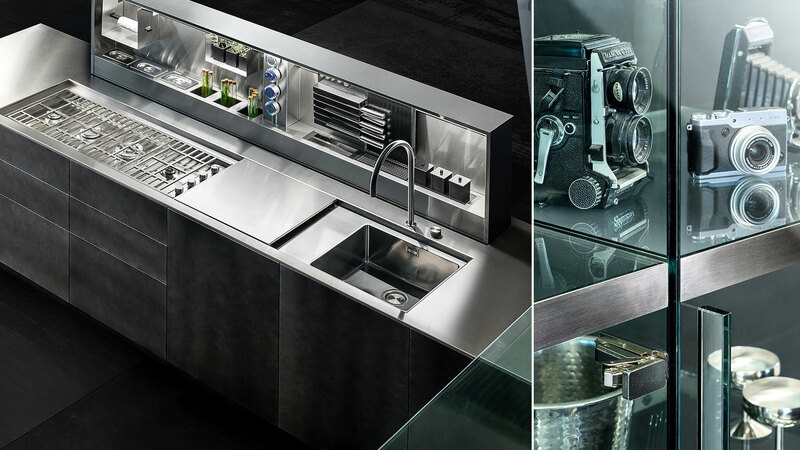 At the centre of the composition, the sink entirely welded to the top is adjacent to a large work area that separates the induction hob and double suspended hood. 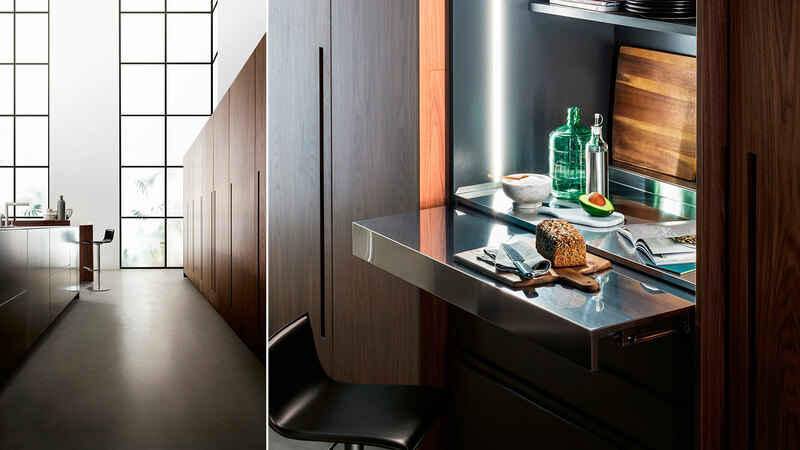 The bases are equipped with pantry compartments on the front with internal drawers or bins at the back. 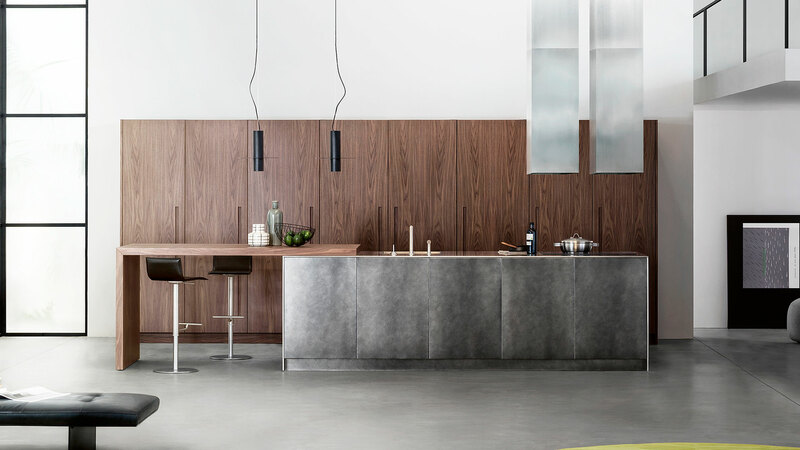 They feature doors and fronts with lacquered effetto acciaio ossidato and push-and-pull opening. 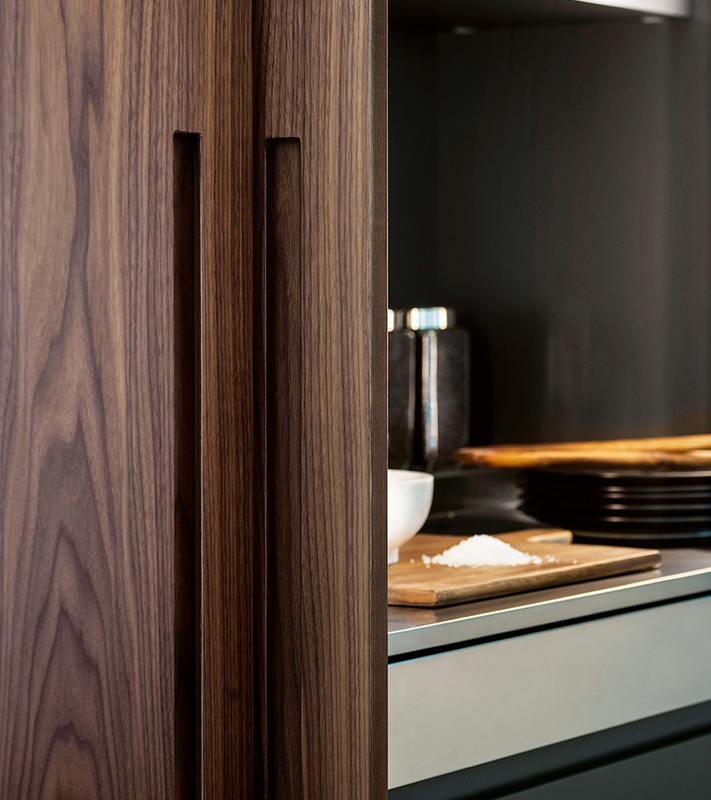 The columns feature instead doors with inside handle in noce Canaletto bigliato, carefully selected to ensure vein continuity on the entire composition and inside the doors. Details that express the quality and tailoring care adopted by TM Italia to render each creation unique. 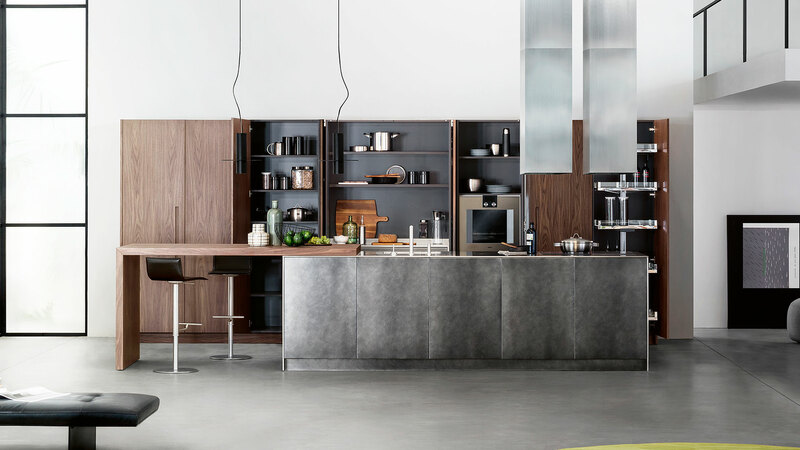 The columns are equipped with multiple accessories: three doors with pantry compartments, a column featuring extractable worktop in stainless steel for improved functionality in the central area, an oven column with pantry compartments, a refrigerator and freezer column, a pantry with front extraction mechanism and five shelves. The central doors feature retractable mechanism, through which they slide inside the structure after opening. A flagship configuration. 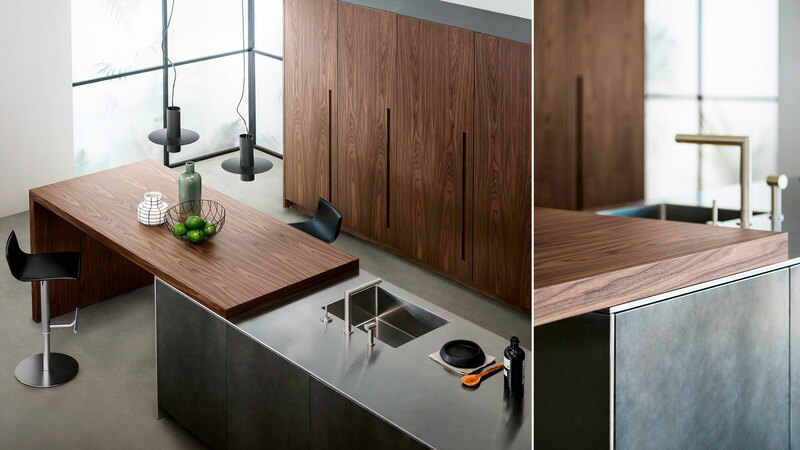 The 6 cm thick overhanging top in noce Canaletto creates an area for social moments intended for four persons or a top for various domestic activities that are becoming more typical of the kitchen environment. 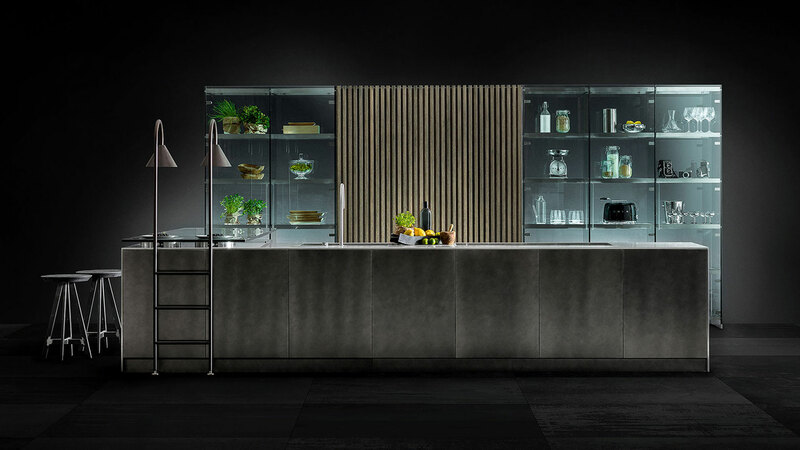 The equipped column features extractable top in stainless steel and internal stripled lights with twilight sensor for automatic shut–off when closing the doors. Doors and fronts may be 22mm or 28mm thick; they have a straight edge and require a handle or push-pull for opening. Doors and fronts with 12mm thick has an interior door structure in aluminum honeycomb. The concept is available in a selected range of finishes. The wall units can be provided with a grip handle on the bottom structural panel.